Miniature Group of Six, bar-mounted, comprising The Most Excellent Order of the British Empire, Member (M.B.E. 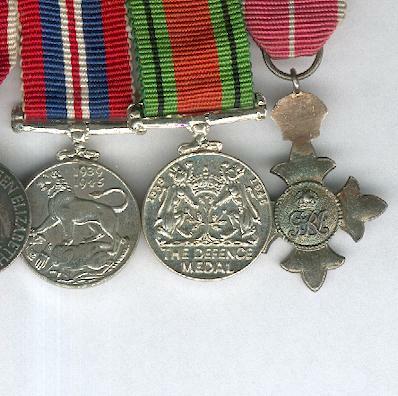 ), Military, 2nd type, since 1935 issue, silver; Defence Medal 1939-1945; War Medal 1939-1945; Coronation Medal 1953; Army Long Service and Good Conduct Medal, George V 1920-1930 issue and Army Meritorious Service Medal, Elizabeth II issue, 1953-1954 version. The Most Excellent Order of the British Empire, Member (M.B.E. ), Military, 2nd type, since 1935 issue, silver. Miniature silver cross patonce on Tudor crown suspension; the face with a circular central medallion imposed with the crowned head and shoulders portraits of King George V and Queen Mary facing left within a ring inscribed ‘FOR GOD AND THE EMPIRE’; the reverse with a circular central medallion with the crowned cipher of King and Emperor George V within a rope border; height 31.97mm (1.26 inches), width 22.46cm (0.88 inch). The Order was instituted by King George V on 4 June 1917 in five grades to acknowledge the service of non-combatants during wartime. In 1918 the Order was divided into Civil and Military divisions. This example is of the second type; prior to 1935, the Order has Britannia rather than King George V and Queen Mary on the face. Today the Order is awarded for distinguished service in any sphere of activity and honorary awards may be made to foreigners. Defence Medal, 1939-1945. Miniature circular cupro-nickel medal with claw and ribbon bar suspension; the face with the head of King George VI facing left, circumscribed ‘GEORGIVS VI D: G: BR. OMN: REX F: D; IND: IMP’. 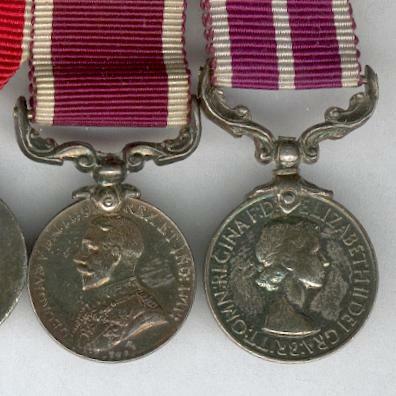 (George VI by the Grace of God King of Great Britain, Defender of the Faith, Emperor of India); the reverse with a crowned oak sapling with lion supporters, wavy lines representing the sea below, dated ‘1939’ and ‘1945’ upper left and upper right respectively, inscribed below ‘THE DEFENCE MEDAL’; diameter 18.65mm (0.73 inch). The medal was instituted in May 1945 to recognise non-operational service from the outbreak of war (3 September 1939) to V.E. Day (8 May 1945) in Europe and to V.J. Day (2 September 1945) overseas. The qualifying service periods were 180 days in overseas areas subject to air attack or other close enemy threat, 360 days in other overseas areas and 1,080 days in the U.K.. For mine and bomb disposal personnel overseas, the qualification period was 90 days. A number of special awards, such as those to the Malta Home Guard and to recipients of a Commendation for Brave Conduct or for Valuable Service in the Air, were also made. War Medal, 1939-1945. Miniature circular cupro-nickel medal with claw and ribbon bar suspension; the face with the crowned head of King George VI facing left, circumscribed ‘GEORGIVS VI D: G: BR: OMN: REX ET INDIAE IMP:’ (George VI by the Grace of God King of Great Britain, Emperor of India);the reverse with a triumphant lion standing on a prostrate dragon, dated ‘1939 1945’ above right; diameter 18.61mm (0.73 inch). 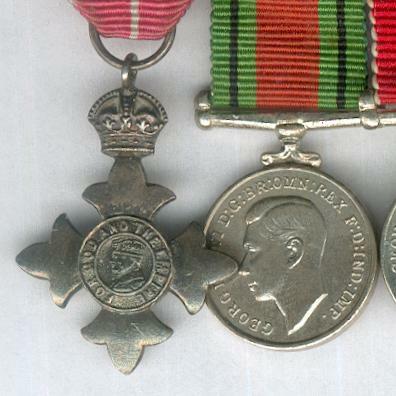 The medal was instituted in 1945 and was awarded to all full-time members of the armed forces who had served at least 28 days between the outbreak of war (3 September 1939) and V.J. Day (2 September 1945). Coronation Medal 1953. Miniature circular silver medal with scroll and laterally-pierced ball suspension; the face with the head and shoulders portrait of Queen Elizabeth II in robes of state with the collar of the Order of the Garter and the badge of the Order of the Bath, wearing a Tudor crown, facing right; the reverse with the crowned cipher of Queen Elizabeth II circumscribed ‘QUEEN ELIZABETH • II • CROWNED 2ND JUNE 1953’; diameter 17.98mm (0.71 inch); age-toned. The medal was instituted on 30 April 1953 to be awarded in June 1953 to eminent persons, members of the government, armed forces, police and public servants to mark the coronation of Queen Elizabeth II. 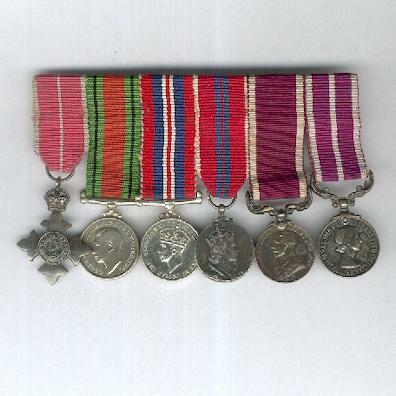 Army Long Service and Good Conduct Medal, George V 1920-1930 issue. Miniature circular silver medal with fixed scroll suspension; the face with the crowned head and shoulders of King George VI in field marshal’s uniform facing left, circumscribed ‘GEORGIUS V BRITT: OMN: REX ET IND: IMP:’ (George V King of Great Britain and Emperor of India); the reverse inscribed ‘FOR / LONG SERVICE / AND / GOOD CONDUCT’ above an arabesque; height overall 27.41mm (1.08 inches), diameter 17.69mm (0.7 inch); age-toned. The medal was instituted in 1830 and has undergone various changes in design and award criteria since that date. At the time this example was awarded, the requirement was 18 years’ exemplary service. 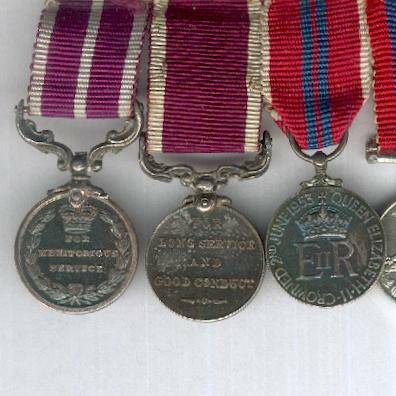 Army Meritorious Service Medal, Elizabeth II issue, 1953-1954 version. Miniature circular silver medal with swivel scroll suspension; the face with the head and shoulders portrait of Queen Elizabeth II facing right, circumscribed ‘ELIZABETH II DEI GRA: BRITT: OMN: REGINA F: D:’ (Elizabeth II by the Grace of God Queen of Great Britain Defender of the Faith); the reverse inscribed ‘FOR / MERITORIOUS / SERVICE’ above an arabesque, within a laurel wreath, a Tudor crown above ; height overall 31.63mm (1.24 inches), diameter 18.35mm (0.72 inch); age-toned. 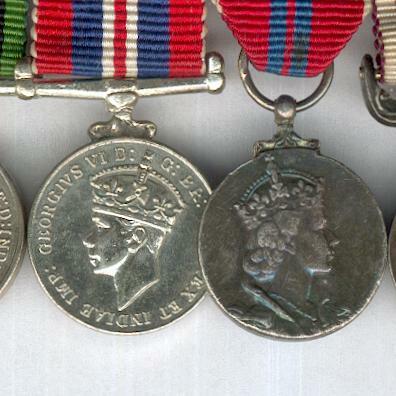 The medal was instituted on 19 December 1845 to reward distinguished and meritorious service by non-commissioned officers of the rank of sergeant and above. The circumscription with ‘BRITT: OMN:’ was issued only from 1953 to 1954. The number issued has always been very limited. 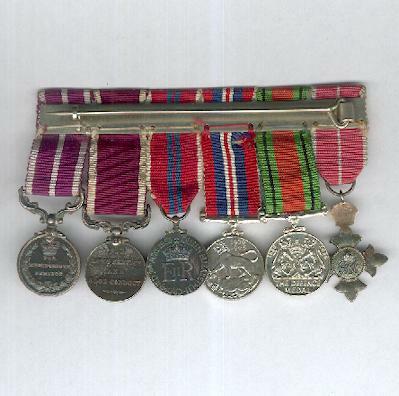 The group is mounted on original ribbons and original bar with pin for wear.